Where pirates roam there is no peace! 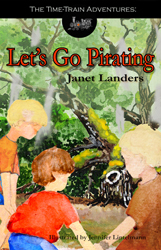 Time travelers Luke, Griffin and Zach ride their magic train back in time to coastal North Carolina and meet up with rogues such as Blackbeard and “Gentleman” Stede Bonnet who are striking fear into the hearts of sailors and landlubbers alike. A great book to learn history and feel what it would be like to know the characters who made the history!